Welcome to the world of royalties, tokenisation and trading. At AIP we develop a totally new approach to the business of music. Our intention is not to compete with any existing streams of revenue. We keep that in place and take it from there. Our mission is to add a new form, a complementary revenue stream, with the tokenisation of your songs. Does that sound interesting? Yes! With the arrival of the streaming services the music industry is closing the gap left behind by illegal downloads. Now we see, finally, increasing revenue and higher profits in the industry. At this point the future value of your music copyrights might be the most interesting asset to invest in, today! 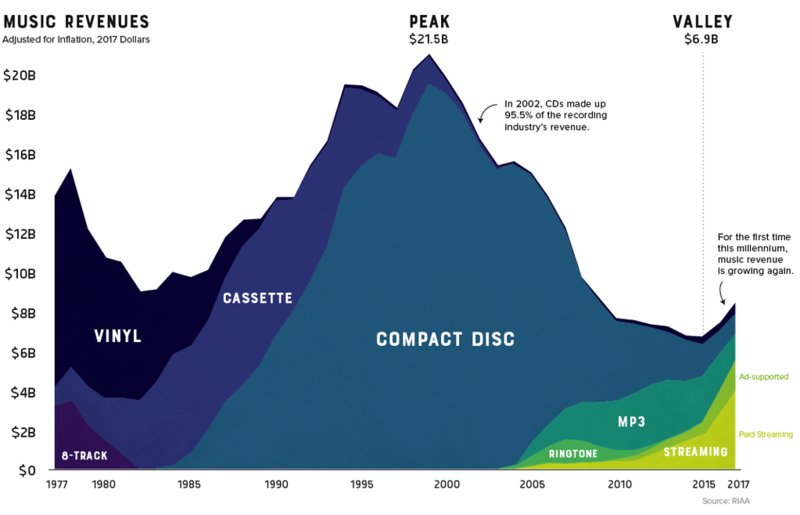 As we can read in the Techcrunch article by Eric Packham, the war over music copyrights has just begun. With AIP we are creating a way to offer artists and content owners an opportunity to directly benefit from this new situation. By activating the online community and with a focus on the long-term market growth, we are creating a win-win situation by offering a direct connection between content creator and fan. Exponential growth in the upcoming decade. With the growing revenue due to streaming services, the new sync opportunities with AR, VR and gaming, and talent scouting by music fans and investors it becomes more and more interesting to invest in music. A fan or smart investor who purchases some shares can now - with AIP - benefit by listening to the song, share it on socials and playlists and create other forms of promotion. This is the kind of activation we all have been looking for. With AIP we give the control over their future earnings and promotion to artists and their fanbases. Now it becomes interesting to invest in music and bridge the gap between passive listening through advertisement and subscription models and actively promoting music investment towards and together with the community. Besides this crowd activation and growth hacking of social reach, we also are sure that the growth of revenue in the music industry, is just at the beginning. According to Billboard in the US alone there are now over 51 million paid subscribers for streaming services. Globally the entire industry grew a stunning 8% last year to $17.3 billion according to the IFPI. 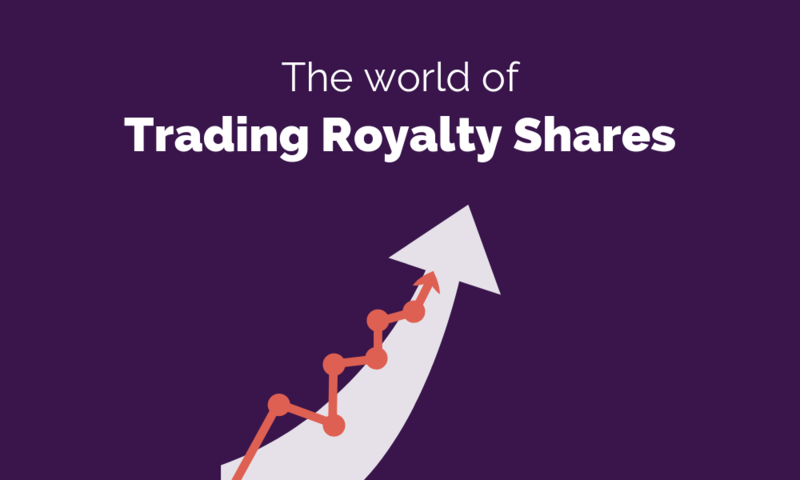 Looking from a traders perspective we found that this visualisation by Nick Routley of Visual Capitalist provides the main reason to start investing in royalty shares today. The image shows that the all time low of the past decade is at its end. At the horizon we see growth coming forth out of the success of streaming services. Better yet, who expected that the segment of ringtones has been such an influence in the global revenue? This brings us towards to five (5!) main reasons to start investing, today!. 1. The trend of growth after an all time low. Buy cheap, grow fast! 2. The substantial effect of streaming and chances in emerging markets. 3. The ability of AIP to activate music fans and investors to benefit equally. 4. The opportunity of potential investors to scout the next superstar. 5. The opportunities of future developments like streaming and ringtones have proven before. At AIP everybody can benefit. Doing our research we found out that we are not alone. In an article by Cherie Hu in Forbes it is ready for us to read that many companies and entities are getting more and more interested in an investment in royalty shares. The question Cherie asks is one that is very accurate. Is now the best time to invest in music royalties? The most interesting statement Cherie Hu makes in this article is given by the data provided by professional music investors. "Within the music industry, publishers are acquiring legacy catalogs for unprecedented, multimillion-dollar prices. According to Billboard, a songwriter’s catalog typically sells for 10 times its net publishing share (NPS), but that multiple has increased to 12x or even 16x in recent years amidst a seller’s market.". We can question if these acquired investments are smart and in line with the current state of the industry. We also must acknowledge that these are the professionals. The top of class in music investments and music copyrights. Did they actually make a wrong move? Or is there more to come and can we use this as inside information? No one can predict the future. We can analyse the past and look at what is happening today. We can investigate the opportunities of tomorrow and the activity in the market. This is why we did more research on companies currently active in the field of music royalties investments and music copyright investments. We consider the current market for royalties and music copyrights as one of high value. By giving the opportunity to copyright owners to activate their audience with royalty shares, we are getting ready for a prosperous decade. Read further and find out what is actually happening in the music business of tomorrow. Currently there are many concepts, ICO’s and new royalty formulas visible online. The most evolved platform is Royalty Exchange. This is a winner takes all auction platform with a working and active model. It is an online marketplace connecting rights holders and private investors for buying and selling royalties through auctions. What actually happens is that rights owners sell their ownership or part of it by auctioning their registrations at PROs like ASCAP, BMI and SESAC. This means that Royalty Exchange really sells ownership. Furthermore it is only ownership of already existing catalogues. What is the main reason for the current owner to sell this? The registration at the PRO also means that it is only focussed on performance rights generated by for instance radio and other forms of broadcasting. Royalty Exchange unsuccessfully launched Royalty Flow, Royalty Flow has tried to launch an IPO on NASDAQ. The company was looking to raise between $11 million and $50 million via a Regulation A+ crowdfunding effort that, if successful, would result in the purchase of a portion of the income stream derived from Eminem's music. The plan was to give fans and investors a way to share in the income from the royalties through dividends paid by the company. The latest news about Royalty exchange is that it took a new direction when acquiring a co-publishing share of Cage the Elephant's catalog. This is interesting and it shows that there is a growing interest in trading royalty shares. It also shows that Royalty Exchange is getting closer to another fascinating company also known as Hipgnosis. Hipgnosis Songs Fund Limited is an investment company listed on the London Stock Exchange. This music IP investment company was co-founded by Merck Mercuriadis (Iron Maiden, Elton John, Macy Gray, Mary J. Blige). Hipgnosis acquires song catalogues and associated musical intellectual property rights to benefit their investors. The company aims to provide investors with an attractive and growing level of income and capital growth through acquiring songs and associated copyrights. It raised an amazing 200 million pounds in there move to their public offering in London City. Vezt offers an active platform open to public and connected with real assets and artists. It recently launched a well designed mobile app where everyone can purchase a part of a song. Vezt is a modern version of Royalty Exchange, offering ISOs (a centralised initial song offering), which provide partial ownership of the PRO registration at ASCAP, BMI or SECAM. What happens is that parts of ownership of existing songs are being sold by one particular and registered rights owner. Although we think this approach is interesting we do consider who benefits here and why current owners are selling part of their ownership. As a buyer it must interest you that you purchase a portion of ownership for a very short-term ranging from 3 to 5 years based upon the performance royalties only. Gramatik and the tokenisation of an artist. Together with SingularDTV the US based electronic artist Gramatik launched his own token GRMTK. Gramatik is renowned for his passionate approach for decentralisation of markets and especially when it comes to the grey area of the music industry, royalty collection and intellectual property ownership. SingalarDTV claims many concepts in this article. In other articles on Medium and by the BBC the launch is mentioned to be a huge success with multiple millions raised. That was back in the days when everything connected to cryptos was instantly a success. These days are over at this particular point. At this point the crypto-madness is more focussed on the immense downsizing of market caps. Although we think this is part of the maturity process we also have been looking at the GRMTK token on etherscan.io. We see that there are about 1140 holders and about 2 trades every month. This is exceptionally low for a token that claimed to raise 24 million US dollar. Also it is publicly shown that 90% of the tokens is owned by two parties. We have no clear or transparent view on the success or current status of this project. So if anyone knows, let us know. AIP is a platform where artists, labels, managements, publishers and any other form of copyright owners can offer a part of their future earnings to the public. With the tokenisation of songs we create a place where your fans can become an essential part of your business model. Fans can now become your investors and with this mutual interest they become your best promoters. We all benefit. The main difference between Vezt and Royalty Exchange at the one side and AIP at the other is that AIP does not sell ownership. We think it is very important for artists to keep what they have and secure their assets for the future. We offer a tailor-made product to the public, consisting of a range of future earnings through royalties. We like to call this shared profit. Furthermore AIP is developed to benefit rights holders with the activation of share holders. AIP delivers an additional revenue stream, while increasing overall turnover with a viral exponent. AIP is the tool of the future to growth hack the music business model with the power of the crowd. With the tokenisation of songs you can monetise music creations in the most direct and independent form. The purpose is to connect your music with your fanbase and create growth with this mutually beneficial model. This is the ultimate win-win situation. Think about it. Music fans can now actually earn while listening to music on any given streaming service. Furthermore they have a shared interest in distributing the songs on their social networks, into the media and on playlists. Therewith we build a stronger position for music productions. We increase the reach of promotional activity. We generate an increase of revenue on the long-term and a direct pay-out on the short-term.